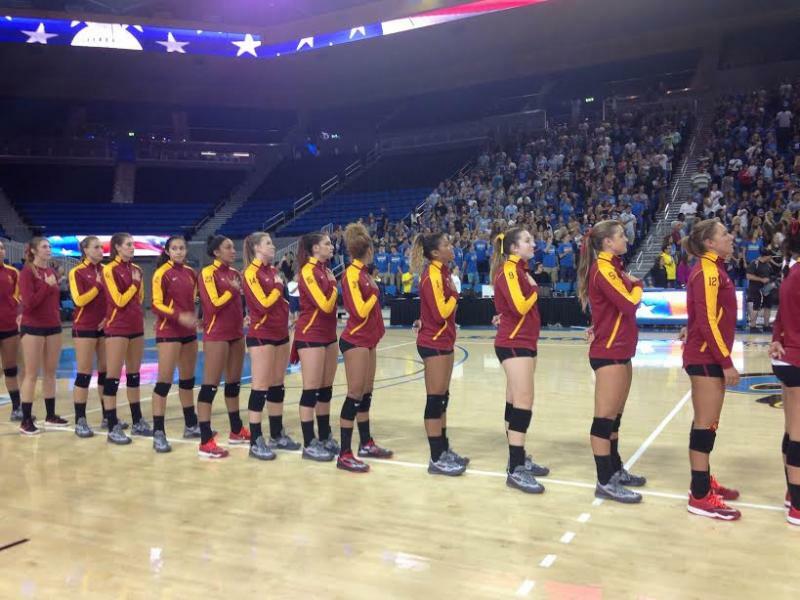 Over an enthusiastic crowd at UCLA’s Pauley Pavilion Wednesday night, the third-ranked USC Women of Troy pulled out their 13th win of the season with a 3-0 set sweep of the No. 13 Bruins. Freshman outside hitter Alyse Ford lead the kills with 11 on the night while Samantha Bricio, senior outside hitter, had 10. Freshman setter Baylee Johnson led the assists with 18. With freshmen such as Ford and Johnson leading the way for USC, Haley noted that the new crop of talent was unfazed with by playing their crosstown rivals. Ford, whose older brother plays football for UCLA, said that she heard some rivalry trash talk from her brother before the game. But that didn’t change her approach. Team captain Bricio said that some of the newer members of the team were anxious before the game because of the rivalry. “I was like, ‘Just calm down, it’s just another game, it’s gonna be a big crowd, just do what you know’,” Bricio said. The Women of Troy capitalized on Bruins’ 10 errors in the second set and won it 25-12, but the first and third sets were decided by closer scores: 25-22 and 25-19. Coach Haley was waiting to see how the team would prevail in in close situations. The Women of Troy face the eighth-ranked Stanford Cardinal in Stanford on Sunday night. Reach staff reporter Jen Mac Ramos here and follow them on Twitter.